1. What is the ‘Biofield’ – is it the ‘Energy Field‘? 3. Is the Biofield the Soul? 4. Does SHEN affect Personal ‘Fate’ or ‘Karma’? 5. Is SHEN involved with Spiritual Practice? 6. 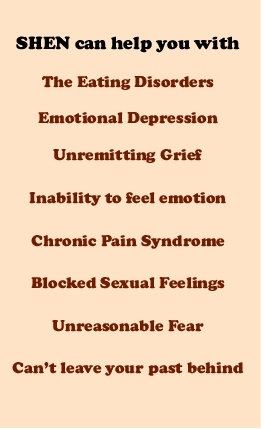 Is SHEN Medical Treatment, Psychotherapy or Counseling? 7. Will SHEN help get me into my anger? 8. What is ACPR and how does Emotional Pain upset our bodies? 9. Do you have to believe in SHEN for it to work? 10. Have clinical studies been carried out on SHEN? 11. How does SHEN compare to Reiki, EFT, TT or Zero Balancing? 12. Does ‘releasing emotion’ mean shouting or acting out? 13. Does SHEN involve physical pressure or manipulation? 14. What are ‘SHEN Flows’? 15. What does SHEN stand for? All molecules in the body are surrounded by tiny electromagnetic fields. These fields combine into a human biofield that fills and surrounds the body, in the same way the small fields around iron molecules combine to form the larger magnetic field that passes through and around a magnet. The biofield is at the low end (zero frequency) of the electromagnetic spectrum. In the 1994 NIH report Alternative Medicine: Expanding Medical Horizons, the National Institutes of Health dropped the term ‘energy field’ and began using ‘biofield’ to avoid confusion since (1) all fields have energy and (2) Energy has precise meanings in other branches of science. It is not unusual for electrical fields to cause us to feel emotions; for example, the dry, hot Santa Ana and West Texas desert winds generate low intensity ionic and electrical fields that cause irritability, anguish, and despair, raise tempers, set people’s teeth on edge, and bring on migraines. Possibly, the ancient Greek philosophers thought the emotions were in a Soul that permeated the physical body (which the biofield does) and that the emotions were contained within it (just as with the biofield). The Greeks believed that the emotions, not the brain, were the primary motivators of our lives (just as we believe). Often during SHEN people remember making assumptions early in life that their lives would “always” be a certain way and now realize that those assumptions were faulty. Not surprisingly, the patterns disappear, without effort, when the emotional states that occurred when the decision was first made are raised to the surface and completed. No, SHEN is not a spiritual practice but many have found that clearing their emotional baggage SHEN helped them along their spiritual path. No, SHEN Therapists work only with the emotions. Releasing and completing buried emotional trauma will likely improve your physical health and change your approach to life, but SHEN Therapists neither offer nor practice medical treatment, psychotherapy, or counseling unless otherwise unless properly licensed to do so. SHEN’s goal is not to get you into your anger but through the anger to resolve the underlying emotions of grief, fear and/or shame that caused the anger. SHEN’s goal is not the pseudo empowerment of acting out in anger, but true empowerment solidly built on inner confidence, self-acceptance and responsibility. Notice how your stomach clenches when you feel a stab of fear, or that it is hard to breathe when your chest is tight with grief? Or how you lose your appetite for lunch when you have to give a speech at the end of it? This is ACPR (Auto-Contractile Pain Reflex) at work. Long-term contractions caused by painful emotion exert continual subtle pressure on the organs and glands in the region of the emotion and, over time, will gravely upset their normal functioning. Yes, successful pilot studies have been completed on SHEN and migraines, SHEN and premenstrual tension, and SHEN and depression. 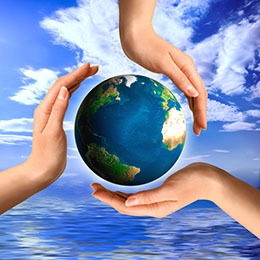 Large majorities in all three studies reported positive, lasting changes. There has been no funding available for the large scale double blind studies necessary for publication in the major medical journals. Only superficially. Our goals and techniques are different. For example, we do not ‘balance’ the aura. We open up the biofield deep inside the physical body to lift painful emotion out and resolve it; this normalizes the biofield. We do not channel a universal energy; we use the naturally occurring energy (called qi) that circulates between our hands. 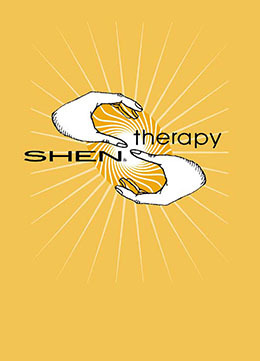 SHEN greatly excels at working with deeply held emotional trauma and the long term trauma that affects the physical organs and behavioral patterns. We discourage screaming and other physical activity because those activities only exhaust the person, not the emotion. Painful emotions do not exit through the throat, hands, or feet, they exit from the front of their emotion centers. No, while physical pressure or manipulation can sometimes trigger a painful emotion that isn’t enough to bring it to a successful conclusion, as SHEN techniques will. SHEN Flow is a term used to describe the qi, flowing between our hands when gently applied to our client’s body. For example Heart Flows are a sequence of special SHEN flows we perform at and around the heart, flows that are designed to open the heart and release deeply held grief. SHEN® is the acronym for Specific Human Emotional Nexus.